Offering 10 ABO Credits and 5 NCLE credits over the weekend. 7 ABO & 5 NCLE on Saturday and 3 ABO Sunday. 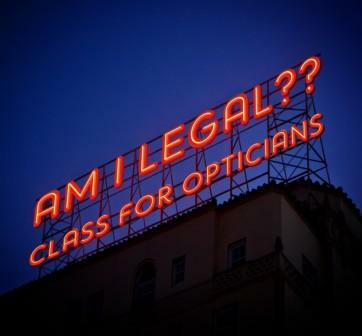 Popular Opticians and the Law seminar. Free for Members. Included in registration for all. Basic classes for new opticians and optical staff or for a refresher: Adjusting, Troubleshooting, Frame Repair and Prism. A National Institute of Health study has found that 94% of Americans age 12 and older have good vision; the remaining 6%, or 14 million, are visually-impaired. Among these more than 11 million have uncorrected impairments, such as near- or farsightedness. This population needs eyeglasses or contact lenses to correct their vision. Certain segments of the population due to race/ethnicity, medical reasons, or economics, have higher rates of impairment. The Optician is an internal part of vision care. The profession has a long and proud history. This lecture will “look” at the past, working environments, salaries, and education that has shaped the modern-day optician. We will assess how technologies (artificial intelligence) and educational change can/will have an effect on the future of Opticianry. The development of the human eye begins just after fertilization and continues after birth. It is a complex process with many different stages that take place at the same time. Often the development of one component of the eye triggers the development of yet another. Preemies are more likely to have health problems, including eye conditions. You should know the risk for vision problems and what you can do to help prevent vision loss. This course will discuss diagnosis such as retinopathy of prematurity, strabismus, and congenital cataracts. Contact lens and eyeglass options will also be discussed. This course examines the types of topography systems available from Placid disc-based systems to evaluation-based designs. Classification of normal and abnormal topographies will be discussed. Basic map types and this interpretation will be presented. Believe it or not, hybrid lenses have been around for more than 30 years. Tandem(piggyback) fittings were also reported in the 1970s. This course will look first at the history of these modalities as well as the “how to” fitting philosophies. We will discuss the pros and cons of each as well as patient selection. Case studies will also be presented. Piggyback or tandem contact lens fitting techniques will also be discussed. This course takes a good look at branding in the optical industry, other venues and the differences between creating a brand and licensing a brand, and the rolls that the vendor, optician and the consumer play. We will examine the relationship between the product and the brand itself in the eyes of the consumer. Examples of “real life” ophthalmic brand positioning are given and how you can use this in your practice. We will look at how to recognize your own niche and how to brand yourself and/or practice. The attendees will break out and create a brand from scratch and share with the others. Explore the method and the madness behind installing hidden hinges. They can be tricky but this class gives a hands-on opportunity for attendees to identify different types of hidden hinges, learn methods to install and remove and when to use them. Attendees are welcome to bring frames they would like to work on during the class. Patients are unique in individual measurements and fit. Sometimes frames are uncomfortable and need modification so patients can comfortably wear them, whether it is stop them from falling off in active kids or adults. Learn hands-on techniques that can be used to modify eyewear in various ways to accommodate the individual preferences of our patients. The “Am I Legal?” class offers answers to questions about Opticians and the Law that are asked every day by opticians and customers alike, including whether or not an optician can charge for a PD, if they are required to give it, and if they can fill an expired prescription. Class Included in Conference registration. Free for OAV Members not registered for conference. $25 for non-members not attending the remaining conference classes.